CPDD Community Website: Should E-cigarette sales be regulated? Most Attorney Generals think so. Should E-cigarette sales be regulated? Most Attorney Generals think so. This past week, Attorney Generals from 37 states, Guam, Puerto Rico, and the US Virgin Islands urged the US Food and Drug Administration (FDA) to regulate E-cigarette advertising, formulation, and sales to minors. 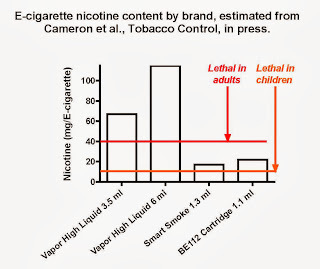 Their case laid out in their letter (PDF) noted that E-cigarette sales are growing “exponentially”, that there are no age restrictions on sales or advertising (unlike regular cigarettes), that E-cigarettes are marketed as safe alternatives to regular cigarettes, and that they contain flavorings that are “appealing to youth”. While E-cigarettes appear to be effective for reducing nicotine withdrawal symptoms in smokers intending to quit, for reducing the numbers of cigarettes smoked by smokers not intending to quit, and for reducing exposure to carcinogens and toxicants found in regular cigarettes, side effects reported in online forums suggest that E-cigarettes induce up to 4 times as many negative as positive side effects. Further, E-cigarette retailers offer many candy-like flavored nicotine solutions (e.g., cotton candy and bubblegum) that seem designed to initiate E-cigarette use by children, rather than help them quit smoking. 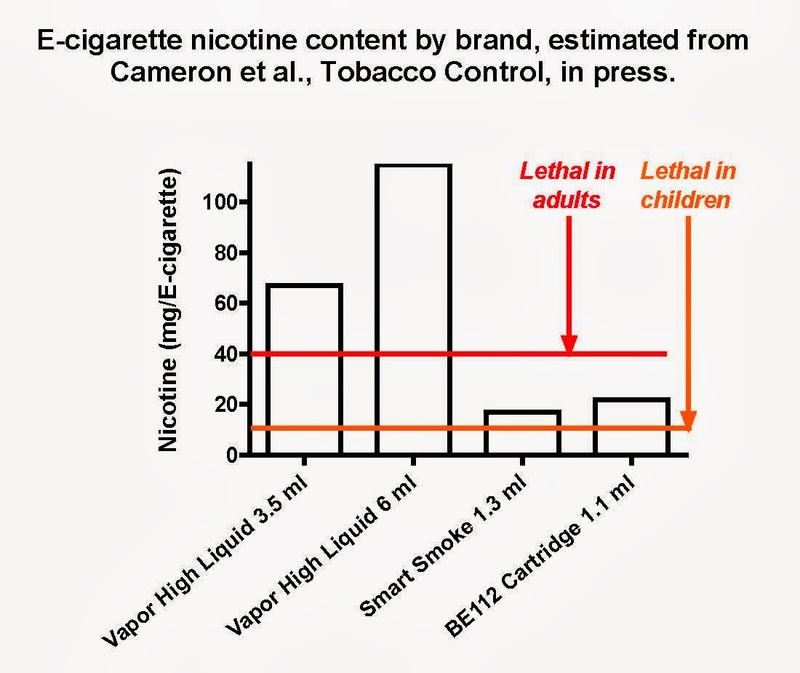 Perhaps more importantly, a recent report analyzing nicotine content in E-cigarette solutions from several brands suggests that each E-cigarette (with nicotine tank/cartridge volumes ranging from 1-6 ml) contains amounts of nicotine exceeding lethal doses in children (10 mg) and adults (40-60 mg) (Figure). The hazard seems even greater for E-cigarette liquid refills sold in volumes ranging from 10-500 ml, which if consumed orally or absorbed transdermally through the skin, can far exceed lethal nicotine doses even for adults (67 to 9950 mg). Thus, the call for E-cigarette regulation by Attorney Generals seems very timely.